A simple office printer may be adequate for your needs, without sacrificing quality and reliability. 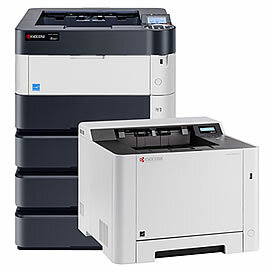 Laser printers are a cost-effective way to produce professional results, and come in a variety of formats and speeds. With many makes and models to choose from, selecting the right machine for your needs can sometimes be a complex decision, and we will be happy to discuss your options, your requirements, and recommend the best machine for your needs and budget. • Huge Choice: Quality machines from the worlds top manufacturers. • Value: Our privileged relationship with manufacturers ensures that we can offer you a competitive deal. • Adaptability: Many of the printers can be upgraded and customised to meet your specific requirements.